Our fig balsamic dressing is the star in this simple salmon dish. Or is it the maple syrup? 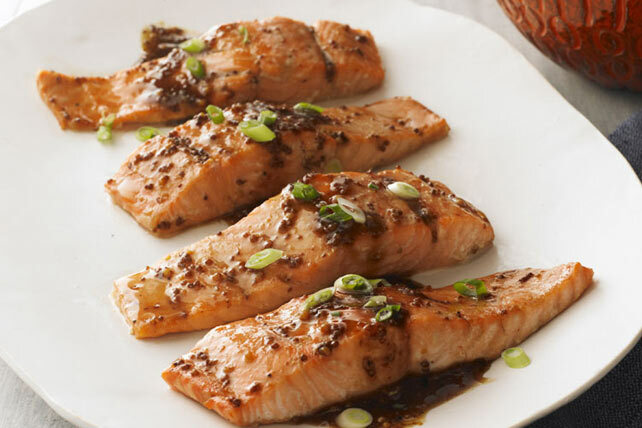 Either way, these Maple-Balsamic Salmon Fillets make a great entrée with a side of steamed rice and fresh green beans. Mix all ingredients except fish. Reserve 1/4 cup dressing mixture; pour remaining over fish in shallow dish. Turn to evenly coat both sides of each fillet. Refrigerate fish, along with reserved dressing mixture, 30 min. to marinate. Heat oven to 450°F. Remove fish from marinade; discard marinade. Place fish in single layer in shallow foil-lined pan. Bake 8 to 10 min. or until fish flakes easily with fork. Meanwhile, bring reserved dressing mixture to boil in saucepan; simmer on medium-low heat 2 to 3 min. or until slightly thickened, stirring frequently. Serve fish topped with sauce. Not only is this delicious recipe a great way to add fish to your diet, but it can also help you eat right.